This sky blue colored t-shirt for kids represents The Little Prince on his asteroid B612. It is 100% cotton for softness and comfort. This red colored t-shirt for kids represents The Little Prince on his asteroid B612. It is 100% cotton for softness and comfort. This white short-sleeves T-shirt for woman, decorated with a visual of the Little Prince on his planet, is 100% cotton. This soft and high quality T-shirt is very pleasant to wear! 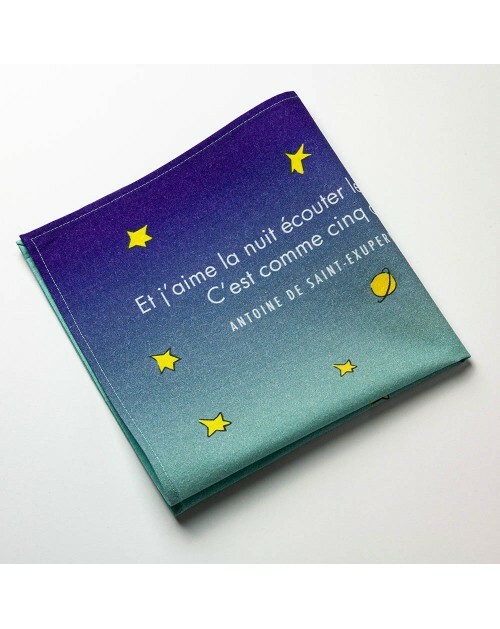 This short-sleeves T-shirt for kids, decorated with a visual of the Little Prince on his planet, is 100% cotton (150g / m²). This soft and high quality T-shirt is very pleasant to wear!